Showing Up Matters…..Showing Up Every Time Matters Even More! I love baseball! If you know me personally, then you know how much I love baseball, to the extent I still play to this day on competitive baseball teams. 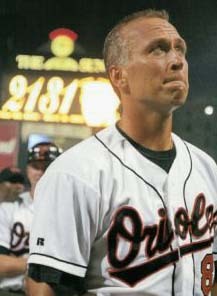 16 years ago, today, Cal Ripken Jr. set the record for most consecutive games played – 2,131. Pretty impressive!! There was a 22-minute standing ovation that voiced the appreciation of the fans in attendance that day – also impressive! How often are you tempted to “phone it in” or decide to not show up and call in sick? As a researcher, you know how intense our schedules are, how easy it can be to catch a cold from flying on various planes, constantly changing climates, and germ-filled hotels (bedbugs anyone?). I learned from my mentor, Tim Ishii, while playing music professionally in college that you’re only as good as your last gig. Words that stick with me to this day. How good was your last “gig”? Did you phone it in because the project was “just another day of toilet paper focus groups”, or the 29th IDI out of 30? Or, did you dial it up a notch and see if you could get even more from the research than you thought you could? We spend so much time in the marketing research industry talking about consistency, non-bias, etc., but how consistent do we strive to be personally? I am guilty of geeking out and being addicted to new learning, and I try to not harness it and let it go wild, but I’ll admit there have been times where I have felt like there was no new learning to be found. The funny thing is that it often turns out to be the most interesting interview of all! Clients appreciate consistency. They like knowing that they can call on you and know exactly what to expect, and that you will give it your all each time, every time. This isn’t rocket science or new thinking, but something we must still constantly keep in mind. By game 2,131 I bet Cal Ripken Jr. had seen just about every single scenario that could possibly happen, but he still showed up. The even more impressive part is that he showed up ready to play and at the top of his game every time he stepped onto the field. Would your clients give you the equivalent of a 22-minute standing ovation? Have you visited the Spych Facebook Page ? You can catch Tim Ishii and his sister, Leslie, as the opening keynote speakers at this year’s ESOMAR Qualitative Summit in Viena! We’re on-site at the 2011 IIR Technology Driven Market Research Event here in Chicago this week! John Snowden is out here with us, and we will be live-tweeting and video blogging on behalf of the Greenbook Blog, New Qual Blog, and IIR. Look for updates from us with one on one interviews from attendees and speakers, and follow along with us by checking out the #TDMR hashtag. Do you have any questions for any of the attendees or speakers? What are you most excited about for the future of Market Research, specifically regarding technology? Has Social Media Research Shown Market Researchers a Different Recession in Our Industry? It’s not a secret that in the craziness of the current economy many companies are going “broke”. But, there is a currency in which our beloved industry operates upon that truly comes before money. That currency is called trust, and recent articles and statistics that have surfaced make me worry about the overall health and liquidity of our nation of researchers. Jeffrey Henning recently wrote a great and enlightening post titled “Consumers Don’t Want to Hear from Social Media Researchers, Unless…”, where he shared some interesting findings from a recent surveying of people about their desire/lack of desire for researchers to utilize their social media-based opinions for market research. The results were basically on the side of …no…but the more interesting and disturbing part was the “why” (I know, my quali is showing ..via Jim Longo) behind those findings. In all seriousness, the most interesting part, or shall I say most disturbing part, was why they were against market researchers utilizing those opinions and comments. The majority of responses fell into two categories of “Market Researchers will willfully misinterpret their responses” and “Fear of researchers getting it wrong through incompetence”. Take a deep breath, pull your tongue from the bottom of your throat and bite it for just a minute while you ask yourself….do they have a point? Say it ain’t so, or question the credibility of the findings, but the fact is that those feelings are present in the population, and there is something that makes people feel that way. Is it really the representative majority of folks, who knows, but there is a population that exists. The more important question is are they validated in their concern? Are they over-reacting? Why do they feel that way? If people cannot trust us then what do we have to offer, other than an incentive, to trade them for their time and opinions? There are implied “conditions of satisfaction” that exist between us, and the folks we speak to in front of the one-way mirror. Somewhere along the way, our beloved industry has lost some credibility, at least in a small population of people. Hard to swallow that medicine? Yeah, it was for me too! Instead of questioning the credibility of the statements and the size of that population, let’s do the more important thing…figure out how to gain that trust back from everyone! Because, from other recent things I have seen, it is not just respondents that have voiced these concerns. I also saw an interesting video of the head of insights for VW, Steve Gatt, speaking on video about our industry not being “up to scratch”. Do you believe this is true? If you know me personally, you know that I am a huge advocate for the future of our industry and want nothing but the best for all of our fellow colleagues and clients. So, I ask you, what do we do to grow and encourage trust with everyone regarding the quality of work our industry represents? What do we do to position ourselves as the keystone to successful marketing and advertising, the building blocks for new product development and the key player in providing value to our clients? 1) Think of the customer/consumer/respondent as your client – go where they are, listen and respond to their needs and then communicate those needs and wants to the companies and brands that are interested in them. 2) Add your value on top – less journalistic and more strategic consultation is the way of the future. Do not lose the neutral unbiased edge, but don’t be afraid to put yourself out there and showcase your expertise. 3) Embrace change – Be smart and approach the future with open arms and open minds. Remember every angry person is a frightened person who is afraid of some loss. 5) Embrace collaboration and possess humility – Collaboration is the key to the future, both for us and the companies and brands that we assist. Know your strengths, focus on them, and partner up to shore up your weaknesses. Not EVERYTHING we do is extremely proprietary and secretive. Remember, as the tide rises, so do all of the boats. I love the market research industry, and I know many of you who do as well. It’s a compelling time for change and growth, so who will lead the way? What would you add to the list? What would you remove? How do we fill the reserves of trust equity and build an industry that is greater than ever? Do I sound like a cheerleader? That’s ok, because I know I stand in a crowd of others equally as loud. Insert thoughts below.